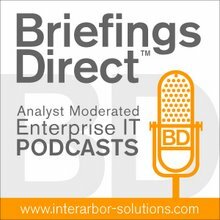 Join me as we unpack with Los the concept of enterprise resiliency as the natural maturity direction for IT security in general. Gardner: Tell me a little bit about your vision. We all understand security and why it’s important, but you've developed, I think, an expanded category for security. Los: Security, over the years, has evolved from an absolute concept of a binary decision: is it secure or is it not? As we mo ve forward, I believe very strongly that what we’re evolving into is, as we’ve heard people talk about, risk management. We need to get out of our ivory towers and we need to start thinking about the fact that attacks happen and insiders happen. There are things that are going to transpire that are beyond our control and things that we cannot plan for. Technology will fail. People and processes will fail. Our own technologies, our own minds will fail us. Our best friends will fail us. People get tempted. This is a human nature that the weakest element will always be a human being, and there's no patch for that. Your people are trained, and your developers are supposedly writing better source code. These are all things that we can test through penetration testing, which means on Sunday between 7:00 p.m. and Monday 3:00 a.m. on the following four IPs, but only when we’re ready. Gardner: I've been speaking with a number of folks lately who hold the opinion that, at least for small-to-medium sized businesses (SMBs), going to the cloud can improve their security and resiliency sufficiently to make it a no-brainer. For enterprises, it might be a longer haul and there might be more complications and issues to manage. Gardner: And as we’re learning more about the HP Converged Cloud, it’s a cloud of clouds. You have hybrid delivery. You might have a variety of sources for applications and services. You might have data in a variety of sources across a variety of organizations, running from on-premises to managed hosting to multiple cloud and SaaS providers. What we’re saying is that because we focus on OpenStack, because we’ve chosen to build our platform completely on OpenStack, because we’re building across a single model, a single way of operating, as [HP CEO] Meg Whitman said at Discover in June. You can build a single security operating model and you'll be able to implement it across your private, public, and hybrid models. Gardner: We’re seeing a lot of highly virtualized environments. We’re talking about virtualized server instances, workloads, and network, storage. Disaster recovery (DR) technologies have evolved to the point where we're mirroring and moving entire data centers virtually from one location to another, if there's a resiliency issue like a natural disaster or a security or cyber attack that impacts an electric grid or something along those lines. You need to do your homework ahead of time, make sure you know what you’re getting into, and make sure you know what technologies are being supported.